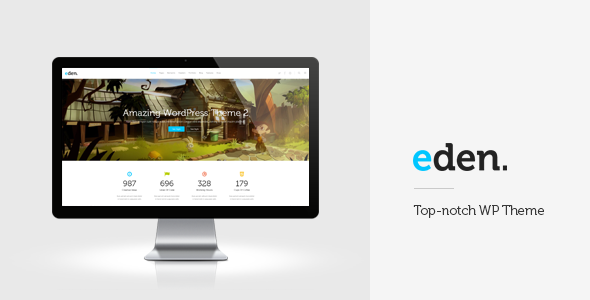 EDEN is a retina multipurpose WordPress theme. Qode Slider – Amazing slide/fade responsive full-screen or fixed height image & video slider with parallax and fade in/out elements animations. Also, for each slide you can set if header should be dark or light, set different position for graphic and text, choose different animation for graphic (flip or fade), fully control title and text (size, color, fonts, line-height, weight, shadow), set custom color for navigation, set different overlay pattern image for video. Fixed Header – You can set header to be fixed, to get smaller on page scroll. Sticky Header – You can set header to be sticky and control scroll amount (from top of the page) when sticky header will appear, if slider is on page, than height of slider is is “amount” for sticky appearance. Sticky Header With Menu On Bottom – Same as sticky menu, only difference is that menu is on the bottom of header with different layout. Different Logos – Different logos for initial and sticky header, also for dark and light color schema there is field for different logo. Qode Search Field – You can turn on/off search functionality, which will show search button at the right side of menu, and toogle search field above menu. Footer – Choose from 1 to 4 columns in footer, set it to be with “unfold” functionality or regular. Bonus Parallax Pages – EDEN comes with an amazing bonus feature – easy to create Parallax pages perfect for presentations, microsites or a new homepage. Interactive Elements – Counters, pie charts, horizontal progress bars, icon progress bars, elements with animation, graph charts. Custom Post Formats – EDEN supports following custom blog post formats: Standard, Gallery, Link, Quote, Video, Audio. Portfolio – Choose between 6 different portfolio single layouts and 3 different portfolio list layouts combined with different number of columns. Blog Masonry Layout – Make your blog page display in masonry layout in default (grid) width or full page width. LayerSlider Responsive WordPress Slider Plugin ($15 value) – Create a responsive (mobile friendly) or fullwidth slider with must-see-effects. Easy-To-Use Powerful Admin Interface – EDEN comes with very intuitive, easy to use admin interface. Add unlimited sliders and slides while you are editing page/post/portfolio, add unlimited portfolio images or videos while editing your portfolio item, add unlimited parallax section to any page. Retina Ready – This theme includes high resolution icons. Smooth Scroll – This theme includes smooth scroll ON/OFF (For Chrome and Opera browsers). Multiple Sidebars – Create unlimited custom sidebars and choose them on global or post/page level. Side Menu – EDEN comes with an side menu widget area. There is invisible scroller implemented. Also, it is automatically closing itself after certain amount of scroll. Fully Responsive – EDEN is a fully responsive Wordpress theme and works perfectly on all screen sizes and mobile devices. One-Click Demo Import – Import whole demo content and set your web site to look same as our demo web site in one click. WPML Ready – Fully compatible with WPML plugin – create multilingual web sites. Translation Ready – This theme is fully prepared for translation to any language using po & mo files. Item Reviewed: New Responsive Retina Multipurpose WordPress Theme 9 out of 10 based on 10 ratings. 9 user reviews.